Gust has announced the newest entry of the long-running Atelier series: Atelier Lydie & Soeur: Alchemists of the Mysteries Painting. The game will be released this winter and will mark the series’ 20th anniversary. The game will be released on PS4, Vita, and Switch, making its debut on Nintendo’s latest console. The game stars the title twin sister characters as they find a portal to a mysterious world in a painting. Unlike previous games in the series where you choose between two characters at the start of the game, you’ll be playing as both sisters throughout the game. The story involves the two girls and their father’s ambition to have the best atelier in their home city of Melveille, which is the capital of the Adalett Kingdom. When the girls come across a mysterious painting to an all new world, they go about life in their city and their adventures in the new world. While the synthesis system will mostly be the same from Atelier Firis, the battle system will involve two group of six characters total fighting monsters. Check out this Gematsu article for an even more detailed look at the game’s mechanics. 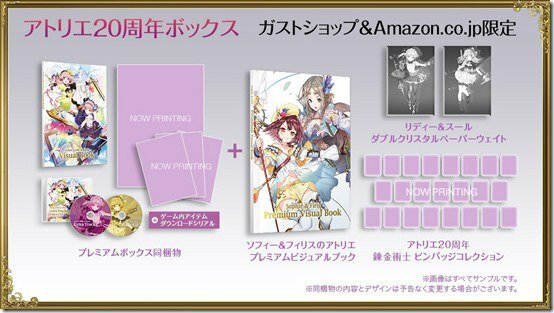 The game will be launched with a Premium Box Edition and the Gust Shop and Amazon Japan exclusive Atelier 20th Anniversary Box. 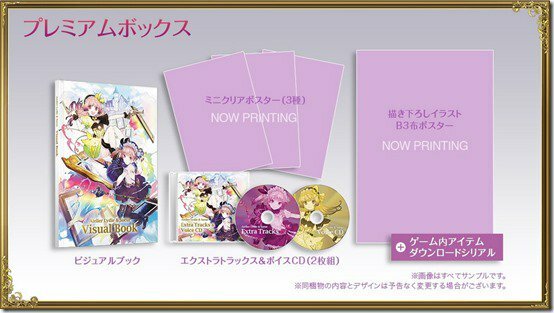 The Premium Box will come with the game, a Visual Book, three posters, an extra tracks and voice CD, a cloth poster, some in-game items and a digital code. The 20th Anniversary Box comes will all the Premium Box stuff, a Sophie & Firis Premium Visual Book, a Lydie & Soeur Double Crystal Paperweight, and an Atelier 20th Anniversary Alchemist Pin Badge Collection. 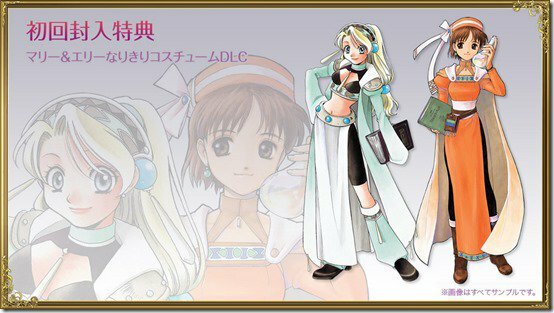 First Print copies of all versions of the game will come with costume DLC codes for Marie and Ellie from Atelier Marie: The Alchemist of Salburg and Atelier Ellie: The Alchemist of Salburg 2 respectively. It’s nice to see Gust go all out for the Atelier series for its 20th anniversary. While the games are currently only scheduled for release in Japan, hopefully we’ll get information on potential western release before long.